That global trade imbalances matter has been made abundantly clear by the ongoing global economic malaise. The likely path to more sustainable levels of trade deficits, however, remains far less clear. Consider the potential global impact of populist cries for protectionist trade policies ostensibly aimed at easing the difficult transition to more sustainable trade and debt balances. In the event of a trade war, we would all lose. Perhaps even more disquieting, however, is how these consequences would most likely play out across nations. The evidence presented in this commentary suggests that countries like China, which depend heavily on total trade in relation to their overall economy, would suffer most severely. This evidence further suggests that instead of pursuing short-term quick fixes that would exacerbate the malaise, global leaders must work together to establish a long-term path to more sustainable trade and debt balances. I recently argued that the inexorable rebalancing of current large trade deficits is a lengthy, structural process (not merely cyclical) that requires global cooperation to put into place a credible fiscal and monetary plan to bring down deficits in an orderly fashion. The continuing absence of such a plan further hampers global economic growth. It has also prompted pressure from citizens for quick fixes — for instance, national protectionist policies. Why such a path is so troubling and must be vigorously avoided is my focus here. As we already know, the countries with a current account surplus (Figure 1) must also be those with exports in excess of imports (Figure 2). Note how the range of imbalances among these nations has widened dramatically in recent decades, an obviously unsustainable path. Which of our select eight countries are the drivers of this widening path? 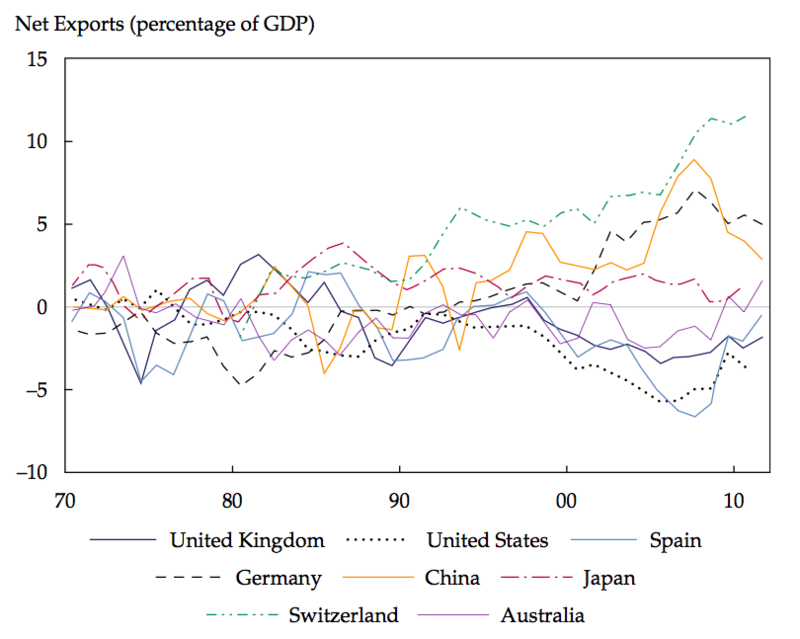 From Figure 2, we can see that Switzerland, Germany, and China currently enjoy the largest net trade surpluses, while the United States, the United Kingdom, and Spain have the largest net deficits. The magnitude of trade deficits matters because, as we also know, a country with an ongoing trade deficit is, by definition, reducing its foreign assets or borrowing. Not so well understood is that global trade patterns are financed by gross asset flows, not net asset flows. Thus, a country must have sufficient gross foreign assets to finance any trade imbalance on an ongoing basis. Indeed, these gross asset financial flows grease the skids of global trade. Practically speaking, trade deficits must be paid for by either selling down gross assets or increasing gross liabilities by selling debt. To properly frame the importance of trade imbalances, let us now consider a somewhat different representation that adds exports and imports together instead of netting trade. 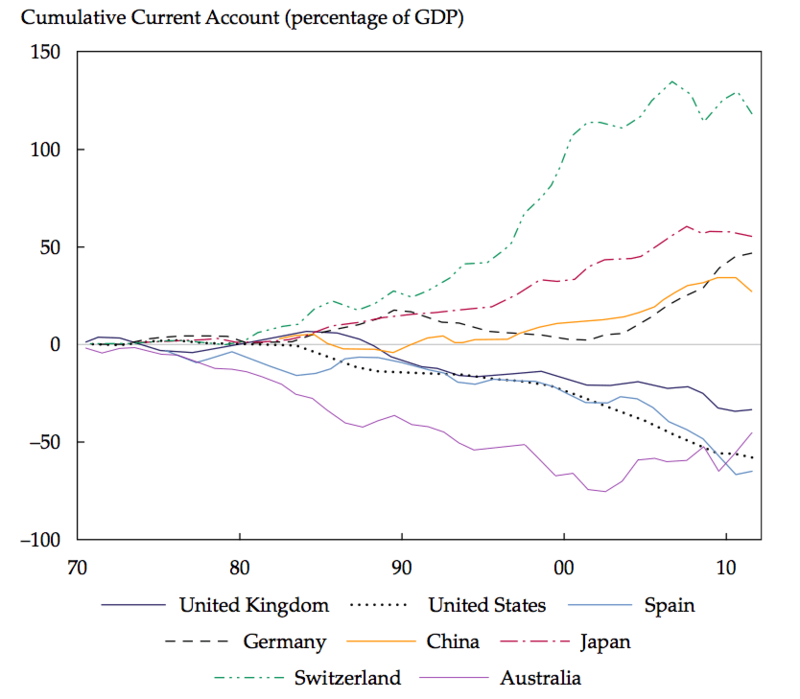 As Figure 3 shows strikingly, the countries shown in Figure 2 with the largest cumulative current account surpluses (Switzerland, Germany, and China) also tend to depend mightily on total trade (imports plus exports) for their overall economy. 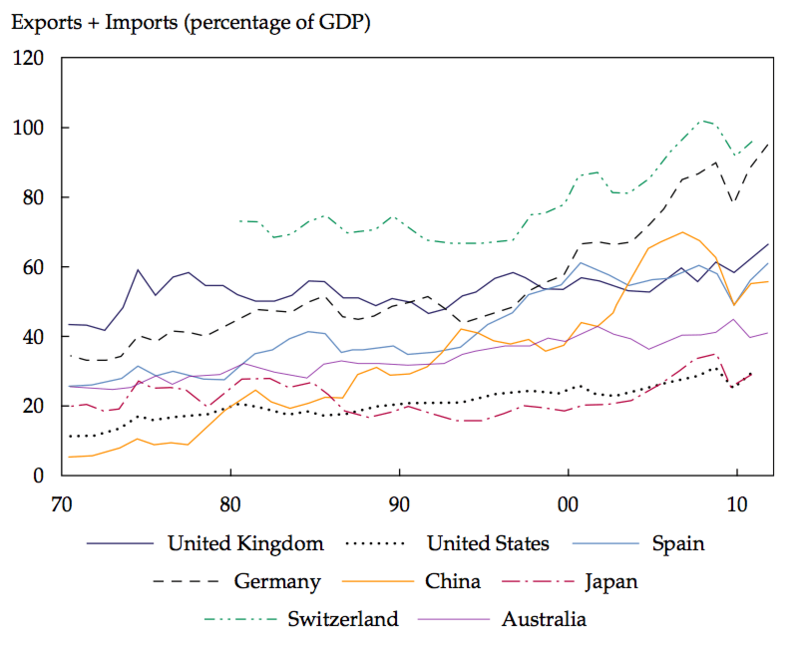 Note that total trade in 2010 accounts for a stunning 100% of GDP in both Germany and Switzerland and about 55% of GDP in China. Total trade also now accounts for a large portion of the GDP of many deficit countries — for example, around two-thirds of GDP in the United Kingdom and Spain. Interestingly, total trade accounts for only about 25% of GDP in the United States, a large debtor country. Viewed in the context of the weighty importance of total trade to their economic well-being, major trading partners will recognize that it is in their best interests to ensure that resource allocation flows relatively smoothly. Such a “consenting adults” relationship suggests that surplus countries provide funding to their trading partners to avoid risking an abrupt reversal or sudden stop in an economy and financial markets that propagates globally. Taken together, the evidence strongly emphasizes the need for an orderly reversal of structural current account imbalances, whereby deficit countries shrink their spending patterns in line with their declining wealth and surplus countries continue to lend. The need for this more enlightened or “informed consenting adults” approach cannot be overstated. It offers the best way out of the current global deficit mess. But it requires strong fiscal leadership, especially in deficit countries to ensure that they are internationally competitive. An alternative, and much more damaging, path that attempts to meet the challenge of sustainable trade deficits runs counter to the informed consenting adults approach. In this “quick fix” scenario, the “adult” nations fail to play together responsibly and instead enter into an antagonistic, protectionist relationship. Such a path, if chosen, would pose severe consequences for nations. Consider the currency war debate now raging in U.S. politics. Should the United States embark upon a protectionist course — say, via a loose monetary policy and currency depreciation — a mutually destructive outcome would be the likely result. As shown in Figure 3, such policies would be particularly painful for those U.S. trading partners that depend heavily on trade for their economies. For instance, China and other important trading partners would face a sort of Hobson’s choice between losing export competitiveness if they allowed their currency to appreciate and higher domestic inflation if they intervened to resist currency appreciation. Consider also China’s historical reliance on capital controls to manage down its own currency’s value in order to promote exports. By allowing its currency to appreciate vis-à-vis the U.S. dollar in recent years, China’s leaders have sought to avoid “importing inflation” — that is, to temper rising domestic inflation commensurate with the powerful effects of U.S. monetary easing. As Figure 2 shows, China’s net exports declined substantially during the recent global slowdown. Unsurprisingly, China’s overall economy slowed down as well. In the event of a trade war with the United States, the adverse impact of China’s currency management policies would likely accelerate and could very well spread across other trade-dependent economies — a seeming race to the bottom in currency weakness. The adverse impact on Australia’s economy comes to mind, with its tightly interconnected, commodity-based export relationship with China. Should a protectionist trade wave emerge, one could reasonably argue that the U.S. economy might fare better than the heavily trade-dependent economies of China and other nations. As previously discussed, the relatively low importance of gross trade flows to U.S. GDP (a trade-to-GDP ratio of 25% versus China’s 55%) would suggest as much. Further contributing to the relative strength of the United States is its net international investment position (NIIP), which places the United States in a much more favorable position than does its reported current account balance. This effect is no doubt due, in large part, to the high U.S. return on external investments. The relative strength of the United States notwithstanding, the spiral of events doesn’t end there. The still sizable U.S. trade deficit makes the United States vulnerable to a sell-off of its assets by foreign officials. In a Chinese–U.S. trade war, China might well respond by diversifying its portfolio (i.e., sell its U.S. Treasury and agency holdings), leading to a rise in U.S. bond yields. The ensuing U.S. bond price weakness would further sap an already fragile U.S. economy, perhaps pushing it into a painful recession. But the knock-on effect doesn’t end there. Economic weakness in the United States would, in turn, further damage China’s economy through even lower exports to the United States owing to continued weakening of U.S. demand. Finally, China’s unloading of U.S. debt would cause self-inflicted pain for China by lowering the value of its substantial reserve assets, thus imposing a double whammy on China’s economy. Adding it all together — combining the fact that China’s total gross trade accounts for more than half its GDP with the codependency of the U.S.–Chinese economic relationship — it seems highly unlikely that either country would be a willing participant in any trade war. As we can see in Figure 3, the United States is critically important to China as a trading partner. China’s interest in a trade war, or suddenly unloading its U.S. bond holdings, seems more hype than reality. The outcome would also be harsh for the United States and the overall global economy. In the end, global leaders should ardently avoid the populist calls to take a protectionist path. So, how should global trade imbalances be rebalanced? Containing the damage of the inexorable deleveraging of current large trade deficits requires global cooperation to put into place a credible fiscal plan to bring down deficits in an orderly fashion. Such alternative solutions as monetary policy alone will continue to prove insufficient, and seeking a solution by waging a trade war should be fiercely resisted. Following such quick-fix paths could produce severe consequences for the global economy, and heavily trade-dependent countries would feel the impact even more harshly. This article originally ran in the January/February 2013 issue of the Financial Analysts Journal. Rodney Sullivan, CFA, is former head of publications at CFA Institute and editor of the Financial Analysts Journal. He was previously director of research at Trigon Healthcare, Inc. (now Anthem Healthcare, Inc.), where he oversaw portfolio strategy and execution that included asset allocation, risk analytics, and equity and fixed-income portfolio management. He holds a BS and an MA from Virginia Commonwealth University.